When Interaction and UX design specialists Nock required assistance with a very specific audio project, they called on the design team at Sound Directions to help them come up with a truly interactive and innovative audio system design. Commissioned by Al Jazeera English, Nock was engaged to create a series of light boxes to convey Al Jazeera’s latest marketing campaign to date ‘Hear the Human Story‘. 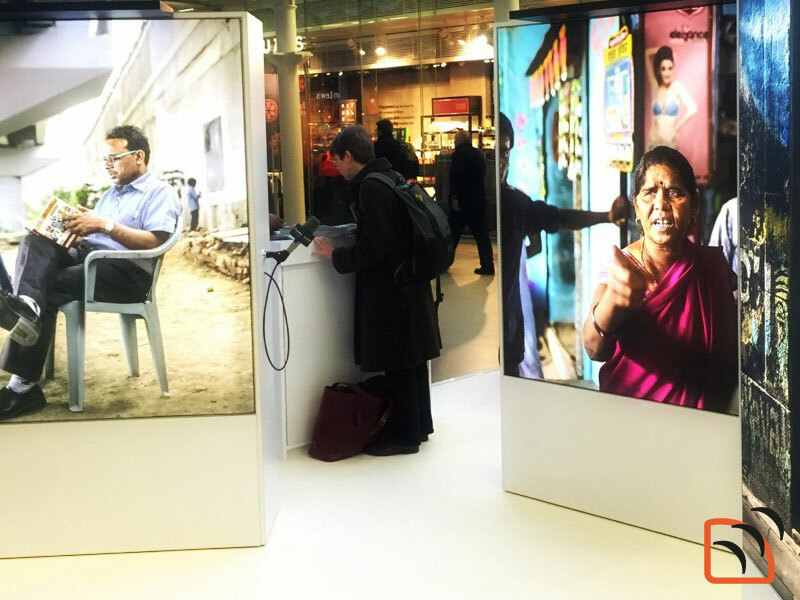 The light boxes were placed at St Pancras International Train Station from 10th-22nd November 2014. Al Jazeera English’s belief is that humanity should always be reflected in its reporting. For the light boxes Nock used 6 human interest stories from around the world and emblazoned beautiful images across the ten light boxes. Each of the images came with a soundtrack narrated by the chief subject of each image but in order to truly bring each of the stories to life, the system designed by Sound Directions and employed by Nock, utilised a microphone with an automatic audio sensing circuit to trigger playback of the stories, however in order to playback the audio message it required a user to pick up a microphone, as per a journalistic reporter and hold it in front of each image, as though the users were interviewing their subjects. The auto-sensing circuits triggered the playback of the story through directional loudspeakers, so that they were only heard directly in front of each image, thereby increasing the intimacy and reality of the moment. “We believe everyone has a story worth hearing. Al Jazeera exists to cover the people often ignored, people whose voices must be heard but are often neglected by mainstream media” commented Al Anstey, Managing Director of Al Jazeera English.